The Rexel Auto+ 80X Cross-Cut Shredder is part of Rexel’s popular Auto Feed Shredder range - allowing you to stack the shredder with up to 80 sheets of paper and let it automatically shred your documents into 4mm x 45mm sized particles. This means each A4 sheet is shredded into approximately 200 pieces and the shredder has a P-3 DIN security rating, suitable for the shredding of confidential documents. Autofeed shredding can be a huge time saver - instead of having to stand and feed the shredder, you can now get on with other tasks instead - and let the shredder get on with the shredding! This makes it great for a small office setting, although it can also be used in the home too (n.b. for different capacity models in the Auto+ range just use our search facility and search ‘Auto+’). Another time saving feature is the ability of the shredder to shred sheets fastened with staples and paperclips - so you don’t have to remove these prior to shredding. 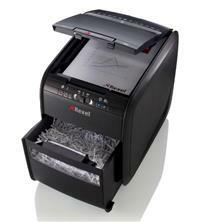 Bin capacity on the Rexel Auto Plus 80X Shredder is 20 litres (equivalent to around 150 sheets of shredded paper). There is also a handy viewing window in the waste bin so you can see when it’s getting too full. In addition, a bin full indicator alerts you to when you need to change it. Another useful feature is the optional manual feed slot which allows you to shred up to 6 sheets manually - great for quick jobs that don’t need the Auto Feed feature. In addition to paper, you can also securely destroy credit cards with the shredder, handy for the shredding of old bank and other cards. Duty cycle is up to 10 minutes of continuous operation, after which a cool down period is required (of around 45 minutes). This cool down requirement will be indicated by the thermometer indicator which lights up on the shredder. The shredder is oiled using Rexel Oil Sheets (product codes 2101948 and 2101949). These should be inserted into the manual feed slot and Rexel recommend doing this after every three bin changes. Warranty on the Rexel Auto+ 80X Cross-Cut Shredder is 2 years for the machine and 7 years for the cutting blades.